Click image to enlarge Lake River from Ridgefield, Washington. Lake River looking downstream, as seen from the Kayak Launch, Ridgefield, Washington. Image taken, September 13, 2003. 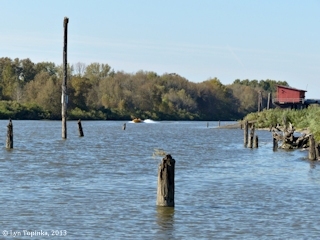 Lake River is an 11-mile-long channel on the Washington side of the Columbia River running parallel to the Columbia. Lake River originates at Vancouver Lake to the south at Columbia River Mile (RM) 98, and then merges with the Columbia at the northern tip of Bachelor Island at RM 88. Sections of the Ridgefield National Wildlife Refuge border the entire length of Lake River and the community of Ridgefield lies along the ridge to the east. Lake River flows past Campbell Lake, Post Office Lake, Green Lake, and Shillapoo Lake. It is named after its source, Vancouver Lake. On November 5, 1805 Lewis and Clark passed an island which they called the island "Green Bryor Isd" (today's Bachelor Island), separated from the shore by a "narrow Chanel". Today the upper end of this channel is known as "Bachelor Island Slough" and the lower end is "Lake River". On their return in 1806, Lewis and Clark camped on the banks of Lake River, in a beautiful meadow upsteam of a village of 14 houses, today referred to as the "Cathlapotle village". 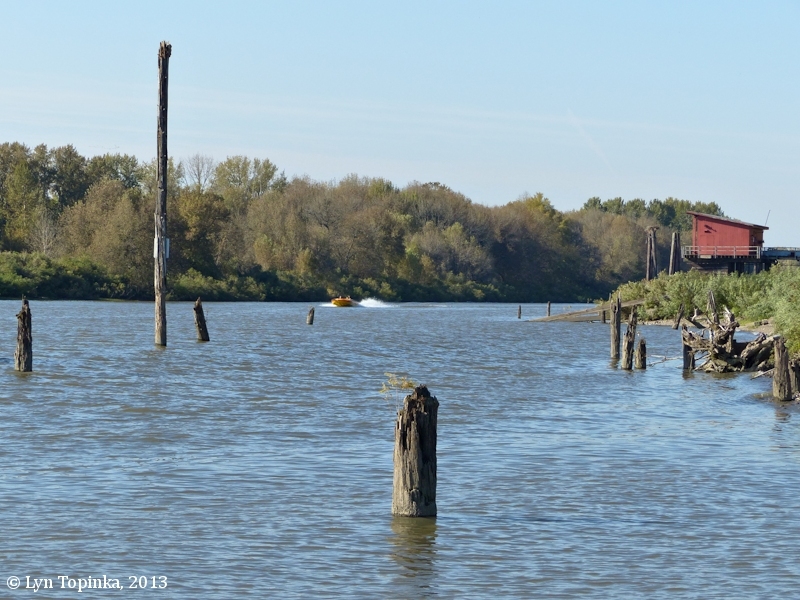 Lewis and Clark's camp is known as "Wapato Portage". Lewis and Clark first pass by the Cathlapotle Village on November 5, 1805, and then on March 29, 1806, on their return, they stop to visit and camp nearby. 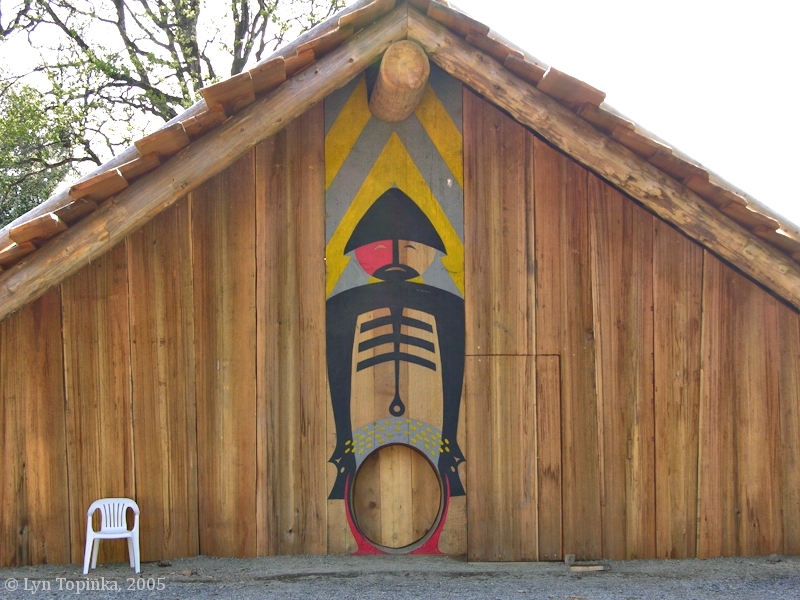 Today a 37 by 78-foot replica of a Chinook plankhouse has been built at the Ridgefield Refuge. Two hundred and fifty-six logs split into 305 planks went into building the house. The plankhouse foundation was prepared during Summer 2003 and the house was completed with opening ceremony on March 29, 2005, the 199th anniversary of Lewis and Clark's visit. Click image to enlarge Cathlapotle Village plankhouse location, Ridgefield NWR, Washington. 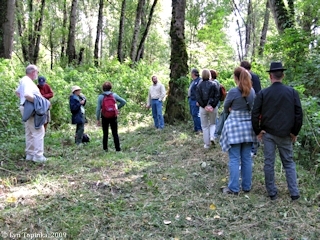 Portland State University professor talking about Village history. Flagged tree shows the location of the northeast corner of the early plankhouse. Image taken, October 10, 2009. In 1841 Charles Wilkes of the U.S. Exploring Expedition, visited Vancouver and the surrounding areas. He called today's Lake River the "Callepuya". 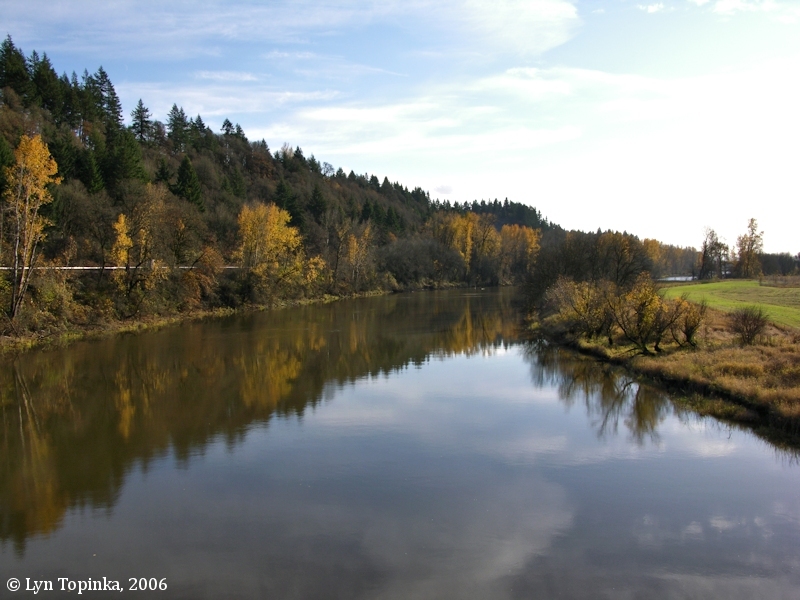 Throughout history Lake River has had many names, including "Calapuya Creek", "Calipaya Inlet", "Vancouver Slough", and "Lake River". 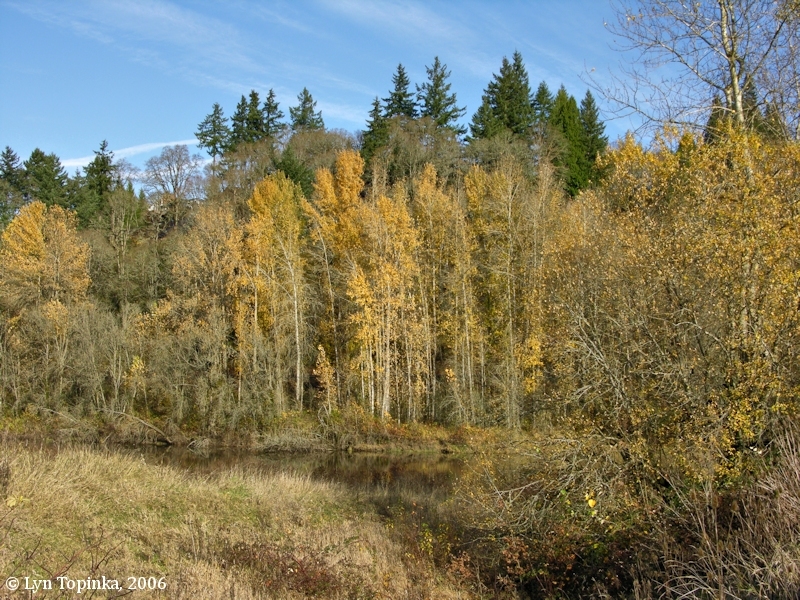 On March 29, 1806, Lewis and Clark camped on the mainland shore of Lake River just upstream of the location where the Lewis River and Lake River meet the Columbia. Today this campsite is known as Wapato Portage. In 1841, Charles Wilkes, of the U.S. Exploring Expedition called Lake River "Calapuya Creek" or the "Callepuya" (see above). The 1854 cadastral survey (tax survey) for T4N R1W, shows "Columbia Island" (Bachelor Island) and "Vancouver Slough" (Lake River). The Carty homestead is located on the east bank of Lake River, south of the junction of Lake River and Bachelor Island Slough, at the location of today's lower tip of Carty Lake. Carty Lake is presumed to be the small unnamed lake near the Carty homestead. The 1860 and 1862 Washington Territory's cadastral surveys for T3N R1W, also call Lake River "Vancouver Slough". The 1881 U.S. Coast and Geodetic Survey's Chart No.5, "Kalama to Fales Landing" and the 1888 Chart No.6, "Fales Landing to Portland" have Lake River listed as "Lake River". Carty Lake is depicted but unnamed, and closer to the location of today. The 1888, U.S. Coast & Geodetic Survey's "Columbia River Sheet No.6, Fales Landing to Portland" (Chart No.6145) shows "Post Office Lake", "Lake River", and "Shallowpool Lake" (Shillapoo Lake). 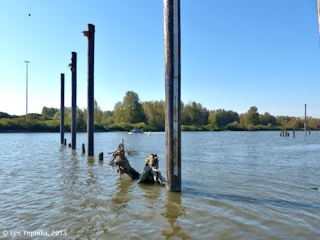 Between Shillapoo Lake and the Columbia River is a stretch labeled "Upper Willow Bar" which runs from "Knapp's Landg" (Knapp Landing) on the north to "Hewlett's Pt." (Hewlett Point) on the south. This corresponds to today's Caterpillar Island and Frenchmans Bar. An 1888 Plat Map of "Clarke County" has Lake River named "Lake River" and a Post Office at today's Ridgefield called "Union Ridge". Donation Land Claims (DLC) were F. Shobart (DLC) south of town, A. Quigley (DLC) north of town, and J. Carty (DLC) in the are of today's Carty Lake. 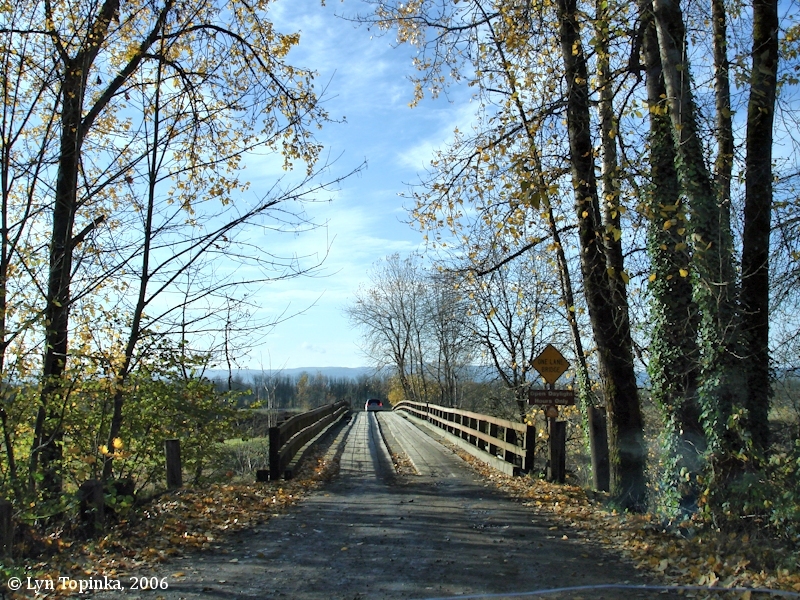 Click image to enlarge Lake River (upper water) as seen from NW Krieger Road, Ridgefield, Washington. Swampy ponds are visible in the middleground. Image taken February 13, 2015. 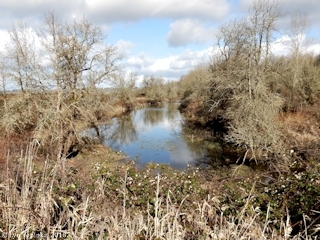 Click image to enlarge Lake River (middle water) as seen from NW Krieger Road, Ridgefield, Washington. Swampy ponds are visible in the foreground and Campbell Lake is behind the trees. Image taken February 13, 2015. Click image to enlarge Lake River as seen from Ridgefield, Washington. Image taken October 6, 2013. Click image to enlarge Lake River recreation, Ridgefield, Washington. Image taken October 6, 2013. Click image to enlarge Lake River gage house, Ridgefield, Washington. Image taken October 6, 2013. 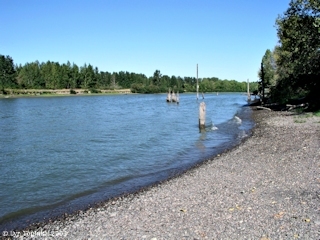 Click image to enlarge Lake River looking upstream, as seen from Ridgefield, Washington. Image taken October 6, 2013. Click image to enlarge Lake River looking downstream, as seen from Ridgefield, Washington. Image taken October 6, 2013. 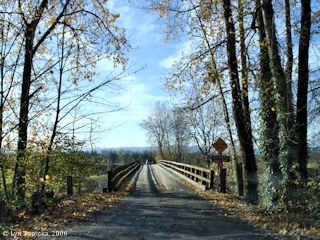 Click image to enlarge Bridge across Lake River, Ridgefield National Wildlife Refuge, Washington. Looking west, River "S" Unit. Image taken, November 25, 2006. Click image to enlarge Lake River, Ridgefield National Wildlife Refuge, Washington. Looking upstream from wooden bridge, at Ridgefield NWR River "S" Unit. Image taken, November 25, 2006. 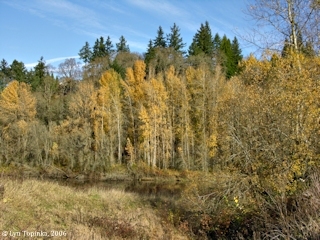 Click image to enlarge Lake River, Ridgefield National Wildlife Refuge, Washington. 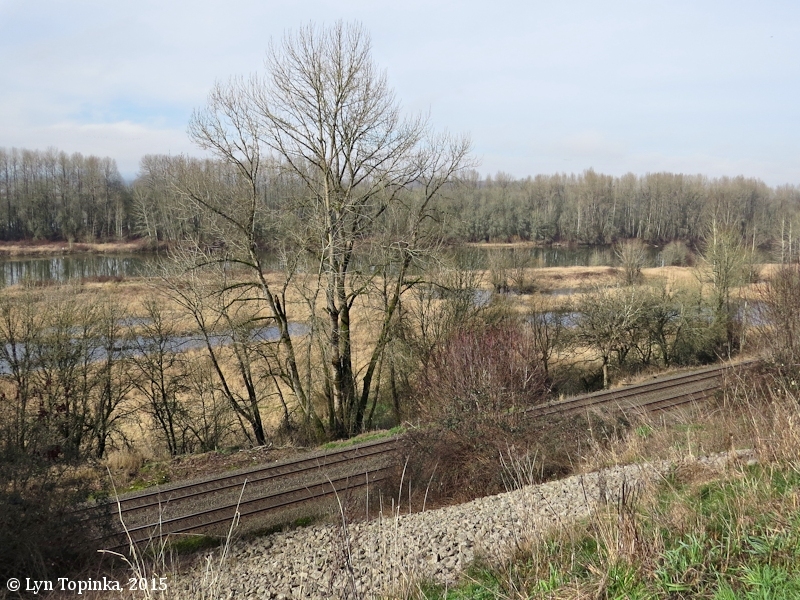 Looking downstream from wooden bridge, at Ridgefield NWR River "S" Unit. Image taken, November 25, 2006. 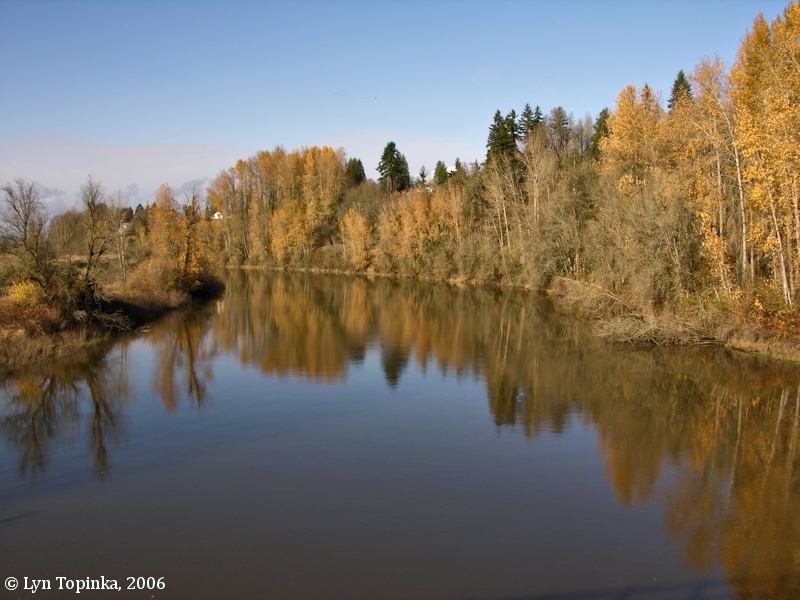 Click image to enlarge Reflections, Fall colors, Lake River, Ridgefield National Wildlife Refuge, Washington. View at Ridgefield NWR River "S" Unit. Image taken, November 25, 2006. 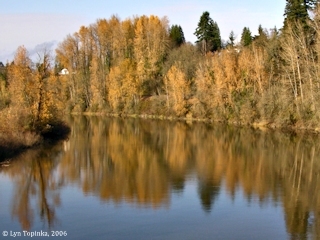 Click image to enlarge Fall colors, Lake River, Ridgefield National Wildlife Refuge, Washington. View at Ridgefield NWR River "S" Unit. Image taken, November 25, 2006. 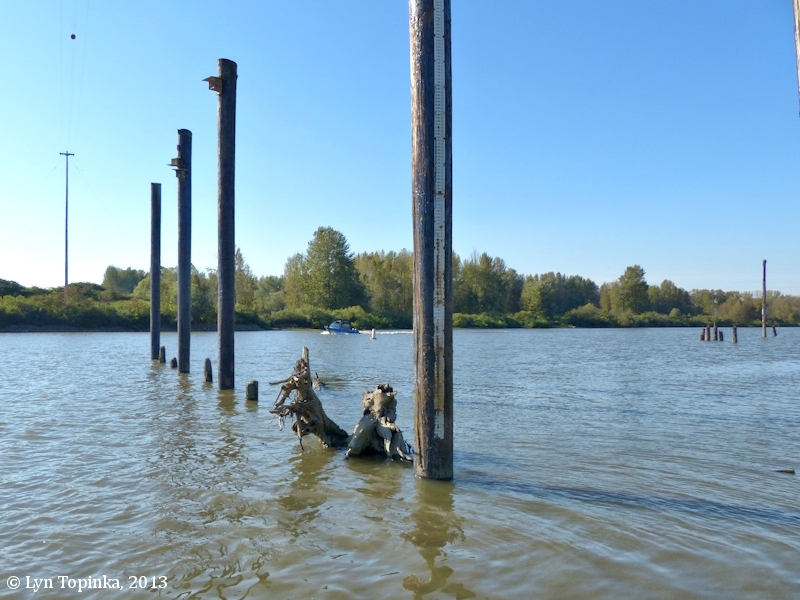 Buckmire Slough is a three-mile-long slough of the Vancouver Lake Lowlands and follows on the west side of Vancouver Lake. 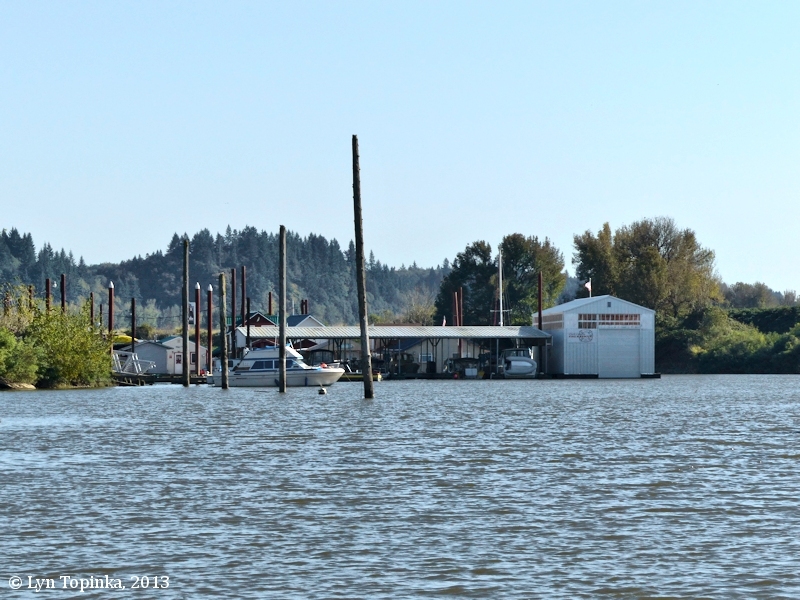 The slough enters Lake River at Lake eleven miles up from its confluence with the Columbia River. 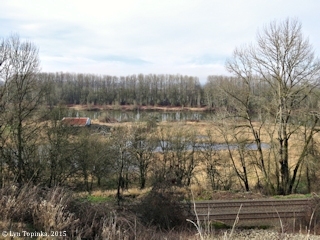 Click image to enlarge Buckmire Slough looking downstream, Vancouver Lake Lowlands, Washington. Image taken February 24, 2018. The 1859 "Official Register of the United States" (U.S. Government Printing Office) lists the "Lake River" Post Office with M.R. Hathaway as Postmaster (2 quarters) and Jeremiah S. Hathaway Postmaster (2 quarters). 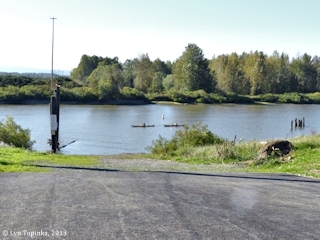 According to Cark Landerholm's 1960 publication "Vancouver Area Chronology, 1784-1958", the April 10, 1861 "Morning Oregonian" listed the post offices of Clarke County as Fisher's Landing, Lake River, Vancouver, and Washougal. The 1862 and 1864 "Official Register of the United States" (U.S. Government Printing Office) lists the "Lake River" Post Office with S.R. Whipple as Postmaster. The 1866 "Official Register" does not have Lake River listed. Salmon Creek merges with Lake River at Lake River Mile (RM) 9. 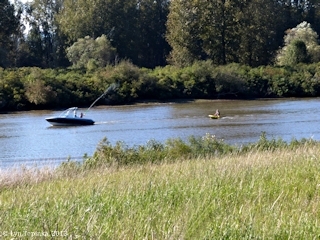 Salmon Creek Regional Park/Klineline Pond is located six miles up Salmon Creek. 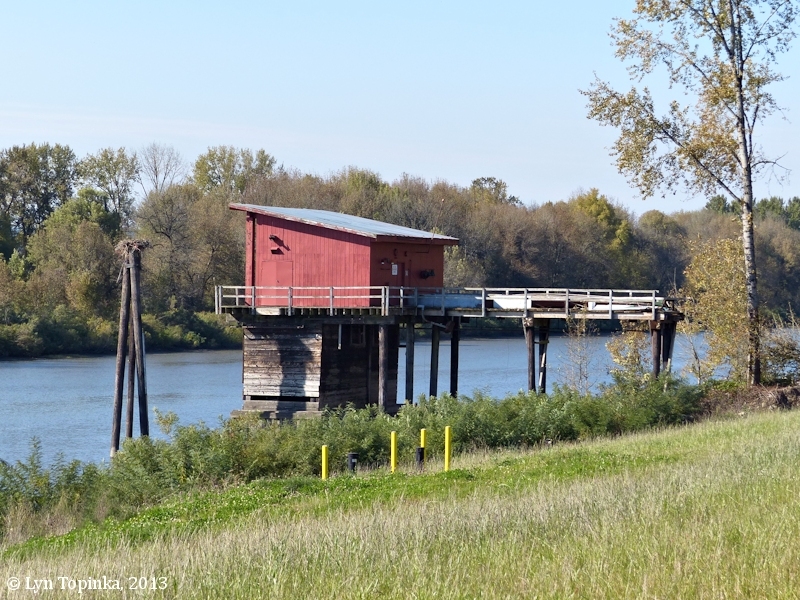 The park features 35 acres of developed parkland and 368 acres of undeveloped green space featuring bottomlands, wetlands, and forested hillsides. 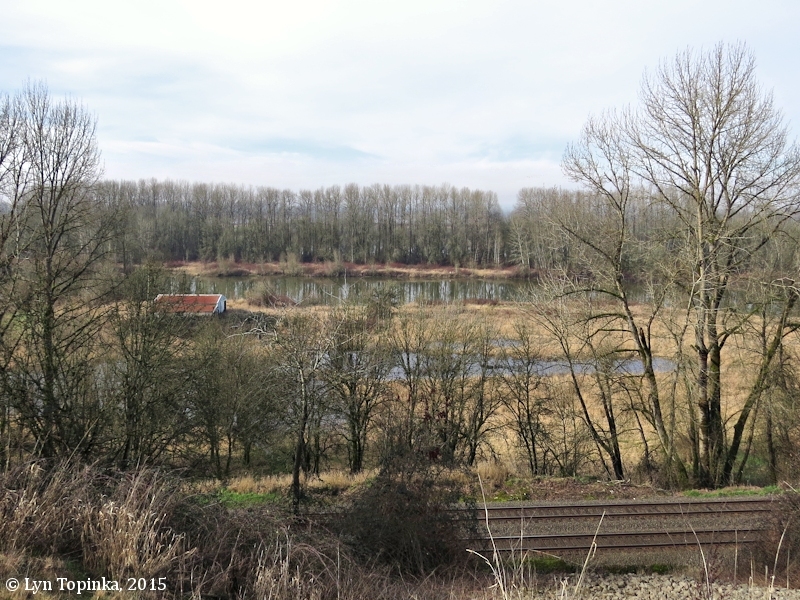 Click image to enlarge Salmon Creek drainage, Vancouver, Washington. 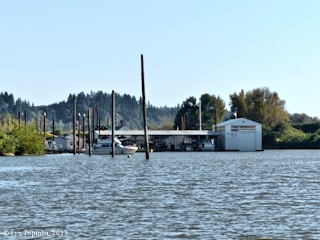 View looking east from NW 36th Avenue, at approximately Salmon Creek Mile 2.5. Image taken, September 3, 2018.